Published 2002 jointly by Caribbean Labour Solidarity and the Socialist History Society. In the 1930s British colonies were spread right across the Caribbean region. In the west, on the Central American mainland, was Belize (then British Honduras). In the centre-north, some 600 miles east of Belize, lay the largest island Jamaica (100 miles south of Cuba), the tiny Cayman Islands (just off Cuba’s south coast) and the chain of numerous small Bahama and Turks & Caicos Islands (off the northern coasts of Cuba, Haiti and the Dominican Republic). Some 1000 miles to the east, forming the boundary of the Caribbean Sea, lay an arc of small islands stretching southwards from the British Virgin Islands for over 400 miles. These were, from north to south (separated mid-way by two French islands) St Kitts, Antigua, Montserrat, Dominica, St. Lucia and Grenada. About 100 miles to the east of this chain lay Barbados. 100 miles to the south (just off the northern coast of South America) lay the larger island of Trinidad and its associated small island Tobago. 150 miles to the south-east of Trinidad and just outside of the Caribbean Sea lay Guyana (then British Guiana), on the South American mainland. In 1936 the populations of these colonies, as recorded by the Colonial Office were: Jamaica – 1,138,558; Trinidad & Tobago – 412,783; Guyana – 332,898; Barbados – 188,294; the Windward Islands of Grenada, St Lucia and St Vincent (combined) – 209,846; the Leeward Islands (Antigua, St Kitts, Montserrat, British Virgin Islands) together with Dominica (later transferred to the Windward Islands colony) -139,759.1 The population of Belize, 98,453 in 1962,2 was probably less than 80,000 in 1936. Although the mainland colonies were much larger than the islands, they were, except in their coastal areas, sparsely populated. In Jamaica in the week ending 12 December 1942, 505,092 persons were classified as gainfully occupied. Of these 283,439 were wage earners of whom 88,981 were classified as unemployed. This did not include 50,528 between ages 15 and 24 who had never had a job. Classified as working on their own account were 153,274 persons. Included in this number were individual peasants or small farmers,3 but, because of the high level of unemployment, this category was abnormally large. This was because it included many enterprising persons seeking work but unable to get a job who had resorted to self-employment as a means of survival. Social structures in the other colonies were fairly similar. Prior to 1932 the only colonies in the region in which it had been lawful to form a trade union had been Jamaica and Guyana, but the legislation did not permit peaceful picketing of employers’ premises and the Jamaican legislation did not protect trade unionists from actions for breach of contract in the event of strikes. Although illegal, the Trinidad Workingmens Association (TWA) had since its formation in 1897, in addition to its other functions, engaged in trade union activities. In 1932, on the advice of Secretary of State Lord Passfield (formerly Sidney Webb), legislation similar to the Jamaican statute was enacted in Trinidad & Tobago, Grenada and St Lucia but trade unions continued to be illegal in the remaining British colonies in the region. The first attempt to establish extra-territorial contacts between workers’ organisations had been made in 1926 when the British Guiana Labour Union convened a labour conference in Georgetown. This had been attended by representatives of the TWA and a trade union in the neighbouring Dutch colony of Suriname. There had been no organisational follow-up and no regional trade union organisation had been established. A similar conference was convened in Trinidad in 1938, with a similarly limited attendance and no follow-up arrangements. In May 1935 there was a strike of Railway workers at Stan Creek, in the organisation with which Soberanis was involved. Police reinforcements were brought in from Belize City and the intimidated strikers returned to work. Soberanis was prosecuted for using seditious language at a public meeting on 1 October in Corozal. The Governor explained his reasons for selecting a particular Magistrate to conduct the trial: “One of my reasons for sending [Magistrate E A] Grant to try ‘Tony’ was that he was a black man. I did not want the trial to be a black v. white affair”. He wanted, said the Governor, that Soberanis should be “put away for a good long sentence”. Soberanis was also charged before the Supreme Court with attempting to “bring His Majesty into hatred, ridicule and contempt”. The legislature, consisting of the Governor presiding, 12 officials, 6 persons nominated by the Governor and only seven members elected on a restricted franchise, was sufficiently alarmed by the demonstrations to appoint a commission of enquiry.12 In 1935 the Government also set up a Wages Advisory Board. One of the members appointed on this Board was Captain Arthur Cipriani, President of the TWA, which in 1934 he had re-named the Trinidad Labour Party. On 13 May 1935 a strike of workers loading bananas at Oracabessa in St. Mary, Jamaica, developed into what the newspaper Plain Talk, a new voice of protest edited by former Garveyite Alfred Mends, described as a riot. The workers blocked the roads to prevent strike breakers from being brought in and cut power lines. Armed police were sent to the town from Kingston.14 On 21 May there was a strike of port workers in the town of Falmouth in Trelawny. This also developed into a riot when the use of strike breakers was threatened and one worker was killed by police gunshot.15 In Kingston, in that same month, banana loaders in the port went on strike and organised a march. On the second day of the strike the police opened fire on the crowd, wounding a woman. On 28 January 1935 cane cutters refused to start reaping the new sugar cane crop on the Shadwell plantation, on the outskirts of Basseterre, the capital of St Kitts. The employers had offered work at 8 pence (16 cents) per ton, a rate which the workers had been forced to accept under protest for reaping the previous years’ crop. News of their refusal to work spread quickly to adjoining plantations where workers also refused to start the crop. A new spirit of determination to fight for their rights spread throughout the island as groups of workers went from plantation to plantation on foot. They prevented work from starting or, in the few places where the cutting of canes had commenced, they persuaded the workers to cease work. A general strike of sugar workers very soon developed. Workers at the island’s sugar factory also came out on strike, demanding a wage increase. Their wages had been reduced by one penny in the shilling in 1930 and subsequently by a further one penny. On 29 January some 200 to 300 workers, some armed with sticks, entered the yard at Buckley’s plantation. The manager and overseer ordered them to leave but they refused to do so. Stones were thrown and, either before or after the stone throwing – it is not clear when, the manager fired his gun into the crowd injuring several workers. Armed police arrived under the command of a former British Army major, but the workers refused to obey his order to disperse, demanding that the manager be arrested. In October 1935 the Governor of the Windward Islands arrived in St Vincent to preside over a meeting of the Legislative Council. At that time the Council consisted of a majority of colonial officials and persons nominated by the Governor, with only of a minority of members elected on the restricted franchise. On 15 October the Governor, in order to add to the Government’s revenues, introduced a measure to increase customs duties on a number of items of popular consumption. It was also the Government’s intention to maintain the high local tariff on sugar which had previously been imposed to assist the sugar producers at the consumers’ expense. The legislature was scheduled to meet again on 21 October to approve the Governor’s proposals and during the intervening week there was mounting opposition to these proposals which would increase the cost of living. Windows of the Court House were smashed and motor cars of some officials were damaged. There were shouts of “We can’t stand more duties on food or clothing” and cries of “We have no work. We are hungry”. The alarmed Governor adjourned the session of the Council. As he and other officials emerged from the Council Chamber, the Governor was pushed and struck and the Attorney General, who had drafted the tax measures, was cuffed by an enraged protester. In the ensuing riot a crowd broke into the prison releasing the ten prisoners there and the business premises of F A Corea, a member of the Council and the island’s largest merchant and plantation owner, were ransacked. Following the arrival of an armed police force, the Riot Act was read and the crowd was fired upon. One person was killed and several were injured. News travels fast in a small island and the rioting soon spread to Georgetown, twenty miles to the south, and Chateaubelair the same distance to the north. Telephone wires were cut and several bridges were destroyed. Military “Volunteers” were rushed in from other islands and armed police and Volunteers were posted to guard the cable and wireless station and the electricity plant. At midnight on 21 October a British warship arrived. On 22 October a state of emergency was proclaimed. Clement Payne, who had been born to Barbadian parents residing in Trinidad, returned to Barbados in March 1937. Shortly after his arrival he began to hold street meetings at Golden Square in Bridgetown, the capital, at which he announced his intention to form a trade union. He had made arrangements to rent a hall on 1 May to celebrate international labour day, but when the proprietor discovered his purpose the arrangement was cancelled. Payne’s meetings attracted increasingly large crowds of workers. Others who assisted him with his plan to launch a trade union were F A Chase, Olrick Grant, Mortimer Skeete, Israel Lovell and Darnley Alleyne. At the end of December 1937 workers on Serge Island Estate in St Thomas, at the eastern end of the island, refused to start reaping the crop at the rates of pay offered. Police were rushed to the area and, on 4 January, 1938, they reported that some 400 to 500 strikers had forced others to cease work. Sixty-three of the strikers were arrested and, over a period of three days from 13 January, were tried before the Resident Magistrate. Three “ring-leaders” were sentenced to one month’s imprisonment with hard labour, 7 were fined £2 and 11 were fined 21/- each with the alternative in default of payment of 30 and 21 days imprisonment respectively. 45 others were admonished and discharged.30 These were relatively lenient sentences. Four people were killed that day, three by police gunshot and one by a police bayonet. On 4 May the Gleaner reported that “the known cases of persons suffering from wounds has not exceeded twenty-five, the arrests up to yesterday afternoon reached 96”.34 But the wounded may have been more numerous as there was a widespread belief that anyone who sought medical treatment would be thereby identifying himself as a participant and inviting arrest. On 13 May the first batch of 27 of the 109 strikers arrested was rushed to trial before the Resident Magistrate at Savanna la Mar, charged with “riotous assembly”. The sentences ranged from 30 days to 1 year’s imprisonment. At the same time the Governor appointed a Commission to enquire into the disorders. On 24 May, the Governor ordered the arrest of William Alexander Bustamante, a popular figure who during recent months had been addressing public protest meetings and writing letters to British Members of Parliament revealing the distressing economic conditions prevailing in the island.35 The arrest of Bustamante and his principal assistant St William Grant,36 and the initial refusal to grant them bail, was a provocation which, despite the appointment of an officially sponsored Conciliation Board on 26 May, unleashed a wave of further strikes and riots. The number of labour disputes in Guyana, which had declined to two in 1936 and four in 1937, rose sharply in 1938. Between January and September in 1938 there were over thirty disputes involving over 12,000 workers.40 But none of these strikes was called by the Man Power Citizens Association, the trade union which had been formed in 1936 and was organising field workers in the sugar industry for the first time, but had not yet been recognised by the Sugar Producers Association. While the members of the West India Royal Commission (see below) were in Guyana taking evidence in February 1939, a major strike broke out at Plantation Leonora. The strike had started among the field workers but, on 16 February, between 70 and 100 strikers entered the factory and persuaded the factory workers to leave. This operation had been peaceful, but when armed police arrived shortly afterwards and arrested five of the strikers, they were pelted with stones and a large crowd assembled at the entrance to the factory. Other police guarding the manager’s house were also stoned. Although the labour rebellions of the 1930s had swept like a wave across the British colonies of the Caribbean region, there were some colonies in which rebellions did not occur. 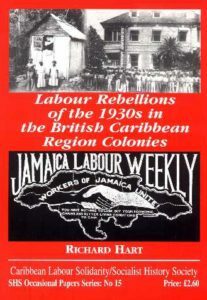 Because of their very small size and the absence of concentrations of workers either in urban centres or on plantations, no labour rebellions occurred in the Bahamas, the Turks and Caicos Islands, the Cayman Islands or the British Virgin Islands. There were also three islands – Dominica, Grenada and Antigua – where, in the 1930s, although there were plantations and distressing poverty existed, no labour rebellions occurred. How is this to be explained? The deadlock was resolved when the colonial Government set up a Commission of Enquiry at which both sides were represented by lawyers. The Union’s representative was Richard Hart, Secretary of the Caribbean Labour Congress, and Quintin O’Connor, a leading trade union official from Trinidad, gave evidence on trade union practice and labour relations on behalf of the Union. Although a tense situation developed when the Governor had troops flown in from Jamaica and the Union withdrew from the Enquiry, calm was restored two weeks later when the troops were withdrawn. The proceedings were orderly and the situation could not be described, as in the other colonies, as a labour rebellion. Trade Unions were made lawful in those colonies where they had previously been unlawful. In all the colonies legislation was amended or introduced making peaceful picketing of employers’ premises lawful and giving trade unionists immunity from actions for breach of contract as a result of strikes. The organisation of trade unions followed in all the colonies and the foundations were laid for the modern trade union movements, which continue to contribute to the struggle for an improved standard of living. 5. O Nigel Bolland, On the March: Labour Rebellions in the British Caribbean 1934-39, Kingston, Ian Randle, 1995, p.45, citing Public Record Office: CO 123/346/35524 – P E Mathews, Report to the Governor, 27 November, 1934. 7. PRO: CO 123/353 File 66571 – Governor A. C. Burns to Secretary of State, 31 March 1935. 8. Bolland, op. cit., p. 50 citing PRO: CO 123/353 File 66571 – S. A. McKinistry to Burns, 22 July 1935. 9. ibid., p. 51 citing PRO: CO 123/253 File 66568 – Burns to Secretary of State. 13 June 1935. 13. Bolland, op. cit., pp. 174-180 citing PRO: CO 111/726 File 60036 – Report of J. Nicole, District Commissioner, 3 October 1934, Report of Commission of Inquiry on the 1935 Disturbances, 24 August, 1936, Actg. Governor C Douglas Jones, 24 January 1935 and Governor G Northcote to Secretary of State, 17 October 1935. 17. R Hart, Rise and Organise: The Birth of the Workers and National Movements in Jamaica (1936 – 1939). 18. Jos N France, “Working Class Struggles of Half a Century”, unpublished collection of articles in The Union Messenger, pp. 92-100 (copy in R. Hart’s possession). 29. R. Hart, Rise and Organise …, pp. 95-97 citing Jamaica Standard, 25 May 1938 and PRO: CO 137/827 File 68868 – minute by J H Emmens, 23 June 1938. Rumble was arrested and, on 27 December 1938, was sentenced to 6 months imprisonment at hard labour. 36. Grant had been a member of Marcus Garvey’s UNIA organisation in New York. A well-known street orator in Kingston, he had in 1938 invited Bustamante to speak on his platform. 38. Later in 1938 N W Manley, KC, took the initiative in launching the People’s National Party. 41. Bolland, op. cit., pp. 184-187 citing PRO: CO 111/762 File 60270 – Report of Leonora Enquiry Commission, 23 March 1939. 43. R Hart, Rise and Organise…, p. 98 quoting PRO: CO 137/827 File 68868/2 – Cabinet Papers.